The popular Elephant Festival is held in the north eastern state of Assam in India. This Elephant festival is mainly celebrated to encourage people to save and conserve elephants. This festival is a major crowd attractor. The government of Assam hosts annual elephant festival in the Kaziranga National Park every year since 2003. In 2003, there were 300 elephants who attended the mela and health information on 211 was collected. However, there has been a sharp decline in the number of elephants being brought to the camps. The number came down to 52 and 42 in 2004 and 2005 respectively. 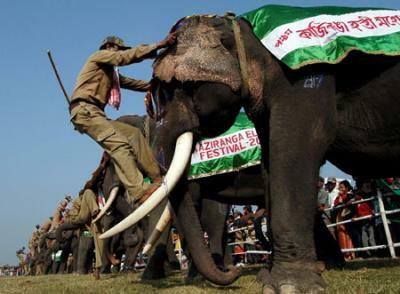 The Festival of Elephants in Kaziranga is an assembly which is aimed at increasing eco-tourism amongst human beings. The Elephant Festival is also intended to raise awareness about the elephant's struggle for all kinds of limited resources with humans.The festival is jointly organised by the Forest Department and Tourism Department of Assam with an objective to highlight and find ways to resolve the increasing man-elephant conflictThousands of tourists flock to Kaziranga in Assam to witness this fantastic Kaziranga Elephant Festival. It is a delightful to see this massive creature following all instructions from his master. The Elephant Festival of Kaziranga in Assam is celebrated every year at the Kaziranga National Park in Assam from 11th February to 17th February.The Elepahant Festival of Assam draws a huge number of crowd in the north eastern state of Assam during this period. The Elephant Festival is a unique event held annually in Assam. The Elephants are groomed to perfection, row upon row of elephants catwalk before an enthralled audience.Hundreds of domestic asiatic elephant, decorated from head to toe, participate in the program. They take part in parade, races, football and dance earning praises from the spectators.